John Terry (born 7 December 1980) is an English professional football player. Terry is a strong, hard-tackling centre back, who is currently captain of Chelsea in the English Premier League, and a regular member of the England national team. Terry was born in Barking, East London and attended Eastbury Comprehensive School. Before being spotted by Chelsea, he played for Sunday League Team Senrab FC. This team featured many future stars including Terry himself, Bobby Zamora, Paul Konchesky, Ledley King and J Lloyd Samuel. He rose through the Chelsea youth system, playing for the club's Youth and Reserve teams before making his Chelsea debut in October 1998. He spent three months with East London rivals West Ham before in March 2000 he joined Nottingham Forest on loan for two months. He wears the number 26 shirt at Chelsea. In season 2003/04, his strong, committed and inspiring displays led to him being handed the captain's armband by manager Claudio Ranieri when Marcel Desailly was out of the side. He played very well in the absence of the French legend, establishing himself as a genuine contender for a first team slot. 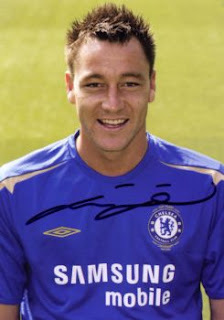 Following Desailly's retirement, new Chelsea manager José Mourinho wanted Terry as his club captain - a choice which was justified throughout the 2004/5 season. Terry scored eight goals and was voted Player of the Year by his fellow professionals in England. In September 2005 he was selected as a member of the World XI at the FIFPro awards. The team was chosen by a vote of professional footballers in 40 countries. In the match between Manchester United and Chelsea (2005/2006), Wayne Rooney tackled him and when he went down, commentators said that John Terry was really in pain, because he was on the ground and did not stand back up immediately, proving that he has projected himself as a no-nonsense defender. Terry is a regular in the England national team, having earned 21 caps as of 14 November 2005. He made his debut in June 2003 against Serbia and Montenegro. He played for his country at Euro 2004, and England Manager Sven-Goran Eriksson said recently he believed Terry to be his first-choice centre back, ahead of the likes of Rio Ferdinand and Sol Campbell. In a game against Poland, he had the honour of wearing England's captain armband, replacing Michael Owen as captain after the latter was taken off. He was the heart of the Chelsea defence that was the most well-marshalled in Football league history in the 2004/05 season, conceding only 15 League goals. In 2005 Terry was voted best defender of the UEFA Champions League tournament, after not only defending and organising his team effectively, but scoring four goals in the tournament including the winning goal against Barcelona in the second round. Early in his career, Terry was involved in an unsavoury incident in a West London nightclub with fellow players Jody Morris and Des Byrne. He was charged with assault and affray but later cleared. During the affair, he received a temporary ban from the national side, which cost him a place in England's 2002 World Cup squad. However, he is now praised as a professional. Along with Frank Lampard, Claude Makélélé and Petr Cech, Terry is regarded as a part of the "spine" of the Chelsea team. Being a Londoner who came through the club's youth system, he is especially popular with Chelsea fans. He has cemented his place in the England squad by being selected for the 2006 World Cup.